From what I’ve seen, many middle to lower income families can qualify for this tax credit. Here’s a breakdown of how the Saver’s Credit works and why you shouldn’t leave this benefit on the table. Taxes 101: What is a tax credit? Tax credits are not tax deductions. Credits can be far more valuable. Tax deductions lower your taxable income which is the number used to calculate the actual taxes you owe. Tax credits, on the other hand, are an actual dollar-for-dollar reduction in the amount of taxes you owe or increase to the amount you are owed, not simply a reduction of your taxable income. So if your final taxes owed are $2,000 and you qualify for a $1,000 tax credit, you now owe $1,000. If you qualify for a tax refund of $500 and also qualify for the same tax credit, you now qualify for a tax refund of $1,500. We should all be eager to grab every tax credit we can! How does the Saver’s Credit Work? Snapshot of the AGI limits for the Saver's Credit. You graduated college within the last few years. You’re newly married and still working towards earning the money you’d like to with a current annual salary of $40,000. After your above the line deductions your AGI is $37,000. Making a $2,000 Roth IRA contribution will result in a $1,000 tax credit from the IRS. A $4,000 Roth IRA contribution will give you a $2,000 tax credit. You participate in your company 401k plan and you earn $65,000 per year. Your kids are all out of the house (bye bye child tax credits), so you and your spouse are looking for ways to receive some extra tax savings. By making contributions to your HSA you’re able to lower your AGI to $62,000. Making a $3,000 401k contribution will give you a $300 tax credit from the IRS. The tax credit is eliminated once your AGI (adjusted gross income) reaches a certain level. 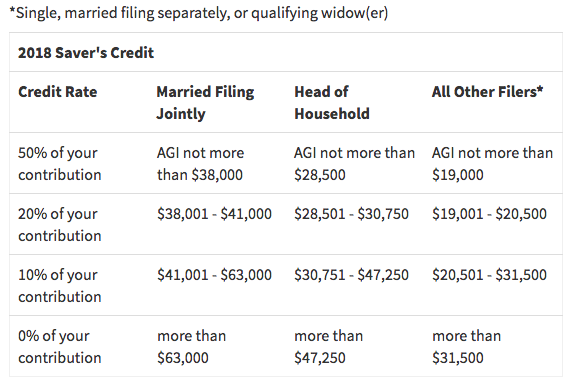 Also keep in mind that the tax credit is much less if you file taxes as a single or married filing separately, as illustrated in the chart. Remember that a tax credit can mean EXTRA money in your pocket come tax season. In this way, I like to look at the Saver's Credit as a contribution from the IRS to your future retirement savings. As long as you have earned income in the year in which you claimed the Saver's Credit and didn't owe too much in taxes, there's no reason why you couldn't simply take the tax refund you earned (which was potentially boosted by your Saver's Credit) and put it directly into your retirement account! Who qualifies for the Saver’s Credit? Besides the AGI thresholds, there are some other eligibility requirements for the Saver’s Credit. You must be 18 or older, you cannot be a full-time student, and you cannot be claimed as a dependent on another person’s tax return. Besides these and the AGI thresholds, there isn’t much keeping savers from participating. The Saver’s Credit can be taken from contributions to a wide variety of retirement plans, including your Roth IRA, Traditional IRA, SIMPLE IRA, or SEP IRA, 401k, 457 or 403b plans. How can I make sure I earn the Saver’s Credit? The IRS isn’t going to make sure you earn the Saver’s Credit if you qualify. It’s up to you to take the necessary steps to ensure eligibility. Here are some things you can do. Before anyone can be eligible for this credit, they need to make qualified retirement plan contributions. Participating through your employer may be the best way, since they may already have an existing 401k or IRA plan. If not, you can simply set up an IRA for yourself. If you’re self-employed, you might consider creating a SEP IRA instead. The Saver’s Credit has very clear AGI thresholds to qualify for your credit. In Example 1, if your AGI went from $37,000 to $38,001, all of a sudden your Saver’s Credit is only 20% of your contribution, not 50%! That could be the difference of over $1,000! For some helpful tips on lowering your AGI, take a look at this article. With every tax break comes a tax form; and the Saver’s Credit is no different. Form 8880 is the form required to qualify for the Saver’s Credit. No form, no credit. Fortunately it’s short and fairly easy to complete. Most tax planning software tools probably do it for you. I’ve tried to be clear on all the benefits and potential roadblocks to qualifying for the Saver’s Credit, but everyone’s tax situation is unique. 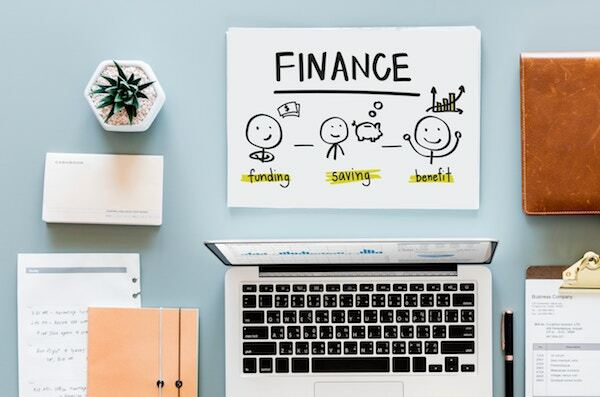 It’s often a good idea to check with a CPA, especially if you have a wide variety of business-related expenses or losses that could potentially qualify you for the Saver’s Credit. I hope this article has been helpful. The Saver’s Credit is an incredible incentive by the IRS to save and can result in thousands of extra dollars earned. If you’re interested in saving for retirement and your AGI is low enough, it’s a no-brainer to start contributing. If you have an employer retirement plan and you’re making contributions, you may already be eligible for this valuable tax credit. Be sure to make it part of your tax planning in 2018! If you’d like to get help starting a retirement plan--either for your individually or for your business--feel free to reach out to me.